Born and based in Toronto, Canada, Joanna's childhood career aspirations of becoming a trapeze artist, a doctor and then a poet, were all a natural progression to becoming a Costume Designer. Having a lucky relocation to Paris, France as an expatriate teenager, Joanna attended the American School of Paris where she outfitted the theatre productions with cast offs found at Parisian flea markets. Continuing on to the Theatre School at Ryerson University, Joanna found she enjoyed the collaborative process of working with the talent and various departments on a production as well as the creative process of making doublets out of the drapes from the teacher’s lounge. She graduated with a Bachelor of Applied Arts even though she played much hooky to outfit the student films across campus. Joanna is honoured to have Costume Designed a variation of television projects including Season 12 of CBC/Shafestbury's MurdochMysteries, Bitten I SPACE/SyFy, The L.A. Complex: Cycle 2 for The CW/CTV, HBO Canada's The Yard, Backstage I & II for Fresh TV/DHX/Family Channel/Disney, Pure Pwnage for Showcase and Disney's My Babysitter is a Vampire II. Selected film credits include The Nellie Bly Story, a Lifetime movie based on true life expose of a Victorian insane asylum (Christina Ricci, Judith Light & Josh Bowman), the Canadian-Italian pizza flavoured feature Little Italy (Hayden Christensen, Emma Roberts & Alyssa Milano) romantic comedy Love Jacked, a South African/Canadian co-pro (Amber Stevens West, Shamier Anderson & Keith David), Sonny Liston bio-pic, Phantom Punch (Ving Rhames), .45 (Milla Jovovich, Stephen Dorff), the unemployed Easter Bunnies in Hank and Mike (Joe Mantegna, Chris Klein), Century Hotel (Colm Feore, Mia Kirschner), Lifetime's Still Small Voices (Catherine Bell), and black comedy Wish You Were Dead (Cary Elwes, Christopher Lloyd, and Gene Simmons). Web Series design include sci-fy comedy Space Janitors seasons 1-3; 1970's Whatever Linda for which Syrokomla and her team won MEJOR VESTUARIO (Best Costume Design) at the Buenos Aires Web Fest and Chateau Laurier which received Best Costume Design Award from The International Academy of Web Television Awards 2018. Joanna has been part of some terrific teams in Northern Ontario designing the features Edge of Winter (Joel Kinnamen & Tom Holland), The Steps (Jason Ritter & James Brolin), Unearthing (Tim Rozon & Jodi Balfour) and the Flower Shop Mystery Series for Hallmark (Brooke Shields & Beau Bridges). The short film ROPEd, based on Margaret Atwood's haunting poem 'Half Hung Mary', was awarded Best Historical Drama at the Atlanta Film Festival in 2017. In 2014 Joanna was honoured with a nomination for the Virginia and Myrtle Cooper Award, awarded to professional Canadian costume designers in Ontario in mid-career to further enrich their careers through research and travel. During her tenure as CAFTCAD President from 2013- 2015, her proudest achievement was that of being the Producer of the Canadian premiere of 'A Conversation with Edith Head' at the Buddies in Bad Times Theatre in Toronto. Joanna is incredibly proud to support the Canadian costume community with her involvement as a founding member of CAFTCAD where she has many opportunities to play dress up with her friends. Her most recent project with CAFTCAD is the creation of the CAFTCAD Costume Design and Arts Awards for February 2019 at the Aga Khan Museum in Toronto. Press Release here. ​Joanna and her teams have received 2019 CAFTCAD Award Nominations for Best Costume Design in TV- Period, for Murdoch Mysteries episode 1203, Best Costume Design in Short Film for ROPEd, Best Costume Design in Web Series for Chateau Laurier, and she submitted her team for Excellence in Crafts: Building for Murdoch Mysteries Season 12. 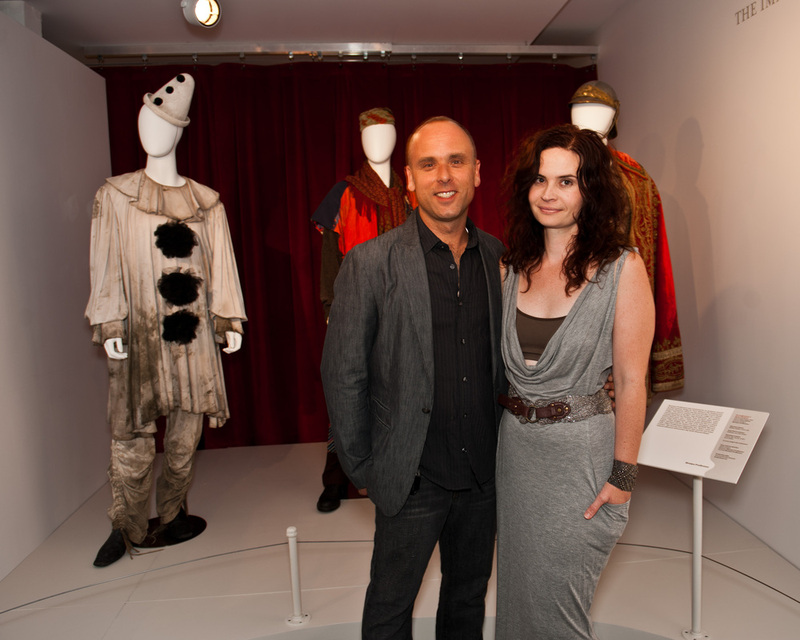 Luis Sequeira, Costume Designer and former CAFTCAD President and I at CAFTCAD's Otherwordly: The Art of Canadian Costume Design Exhibit at the TIFF Bell Lightbox in 2011 during the Toronto International Film Festival.